Click on the links below to help you conceptualize your project and view websites of the companies that provide the products we use. A Paver is a paving-stone, -tile, or brick-like piece of concrete commonly used as exterior flooring. In a factory, pavers are made by pouring a mixture of concrete and some type of coloring agent into a mold of some shape and allowing to set. They are applied by spreading sand on a foundation, and then laying the pavers in the desired pattern. No actual adhesive or retaining method is used other than the weight of the paver itself. 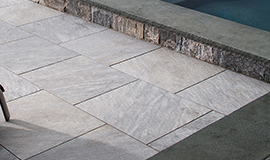 Pavers can be used to make driveways, patios, and other outdoor platforms. A Brick is a block or a single unit of a kneaded clay-bearing soil, sand and lime, or concrete material, fire hardened or air dried, used in masonry construction. Fired bricks are the most common type, and are laid in patterns using various kinds of mortar to make a durable structure. 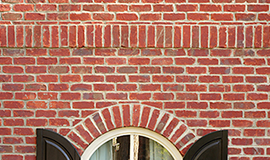 Bricks are produced in many types and sizes, and vary with region and time period. Natural Stone is quarried out of mountains and underground mines from all over the world. 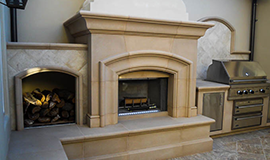 Stone blocks are then transported to finishing plants where they are cut into various sizes and shapes and finished into a polished, honed, flamed, brushed, or hammered state, based on the customer’s specifications. 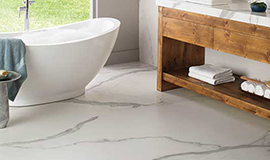 Some stones may have extreme variation in color and veining from tile to tile or slab to slab. This characteristic is common in many types of stone, and is part of the inherent beauty of using a natural product in your home or project. The most common stones are: marble, granite, travertine, limestone, slate, sandstone, and quartzite. Stone veneer is a manufactured decorative building material made to replicate the look of natural stone, and is used as a protective and decorative covering for exterior or interior horizontal walls and surfaces. The veneer is typically 1 inch thick weighs less than 15 pounds per square foot so that additional structural support is not required. . The names artificial stones, stacked stone veneer, manufactured stone, and flexible stone veneer are also used for stone veneer. Precast concrete is a construction product produced by casting concrete in a reusable mold or “form” which is then cured in a controlled environment, transported to the construction site, and lifted into place. In contrast, standard concrete is poured into site-specific forms and cured on site. Precast stone is distinguished from precast concrete by using a fine aggregate in the mixture, so the final product approaches the appearance of naturally occurring rock or stone.